NORTH EASTON, Mass. – Bishop Feehan was just three outs away from scoring an upset on the road of Oliver Ames. But the Tigers showed just how quickly they can change a game with their offense. Three straight hits resulted in two runs and a tie game, sending the game to extras. And in extra innings, Oliver Ames needed just two innings to breakthrough, earning a 3-2 walk-off win over the Shamrocks in nine innings. 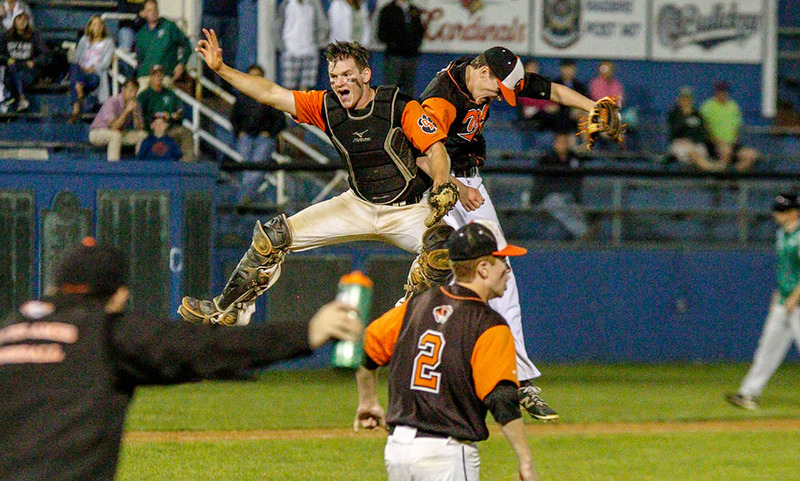 “I give my guys a lot of credit to come back in that seventh inning,” said OA head coach Joe Abarr. “[Feehan starting pitcher Colin Gauther] did a phenomenal job, he was mixing pitches and getting ahead of almost every batter and I could tell it was getting to our guys. Gauthier tamed the Tigers through the first six innings, allowing just four hits and issuing one walk. And of those five baserunners, only Sean O’Brien (double) reached past third. But Matt McCormack’s double to lead off the seventh inning gave the Tigers the spark they needed. McCormack had singled back in the second inning but was picked off at first. A half inning later, Feehan capitalized on that momentum and scored the game’s first run. With McCormack on second, junior Jake Erlich collected his first hit with a single into right field. That was enough for McCormack to sprint around third to bring OA within a run, down 2-1. Abarr then called upon sophomore Jacob Levine to come in and pinch hit. Despite not playing all game, Levine answered the call in impressive fashion. The sophomore got a hold of one and ripped a deep shot to the gap in right-center field. Pinch runner Ezra Coyne came racing around from first to tie the game and Levine was into third with a stand up triple with no outs. OA couldn’t get the winning run across though as Gauthier got three straight outs without the ball leaving the infield, sending the game to extras. OA starter Michael Mulrean didn’t skip a beat in either the eighth or ninth innings. He got two fly balls to center and then made a nice play on a slow grounder for an unassisted out. In the top of the ninth, Mulrean sandwiched his 10th and 11th strikeouts around a 6-3 ground out. McCormack was once again the catalyst for OA in the bottom of the ninth. His patience paid off, drawing a leadoff walk. A one-out single from Nick Zwerle advanced McCormack to second. “[McCormack] stepped up for us early in the year as a DH and then he had a slump where he was struggling a little bit,” Abarr said. “He took a great batting practice the other day, he was all over the ball in our scrimmage against Brockton. After that scrimmage, I told him he was going to be the DH for us and he really stepped up for us. He could have let that [pickoff] situation break him but he didn’t, he showed a lot of mental toughness. Junior CJ Deveau, who entered the at-bat 0-for-2 on the day, tried to lay a bunt down on the first pitch but it went foul. Three pitches later and the junior drove a shot to center field just out of the reach of the outfielder and McCormack sprinted his way to the plate for the walk-off win. Feehan took the lead in the top of the third inning. Back to back singles put runners on first and second but a sacrifice bunt attempt turned into an out when the ball hit the batter. A chopper got just through the gap on the left side allowing Joe Castano to come home and score for the first run. Mulrean induced an infield fly and pop up to right to escape without further damage. The Shamrocks capitalized on a pair of OA mistakes in the fifth inning to double their lead. Castano reached on an infield single and took second on an errant throw. He took third on an infield groundout and then came home to score on a passed ball to make it 2-0. Beyond those chances, Mulrean had his way with the Shamrocks lineup. He allowed just five hits, only one of which dropped in shallow center field. He retired the side in each of the first, second, fourth, eighth and ninth innings. He had a pair of strikeouts in the second, fourth, fifth, sixth, and nine innings. He had just one walk all game. 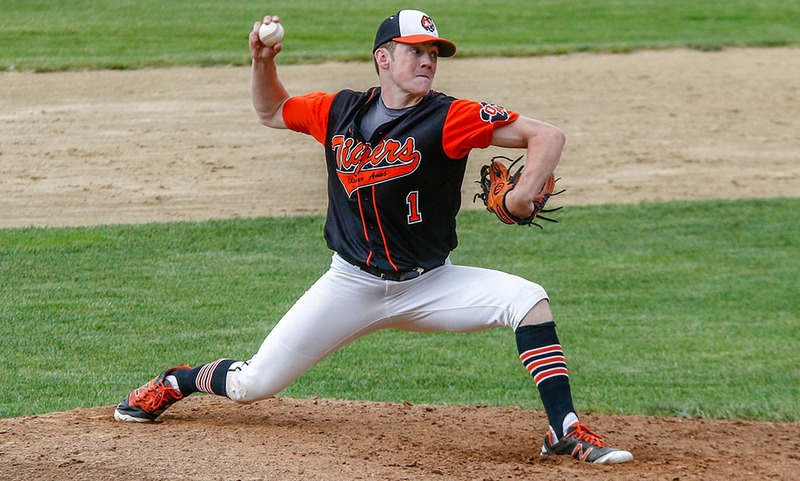 Oliver Ames baseball (14-7) advances to the D2 South quarterfinal round and will host #14 Nauset (7-12), who upset #3 Whitman-Hanson, 3-0, in the first round. The Tigers will welcome Nauset to Frothingham on Tuesday at 4:00.